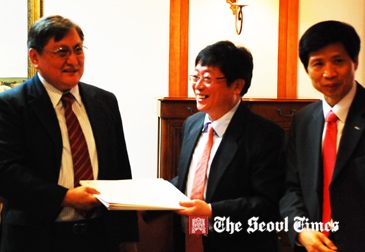 AJA's founding President Lee Sang-Ki (center) delivers a letter of petition to Mongolian Ambassador to Seoul Gerel Dorjpalam (left) at its embassy in Seoul on June 2, 2011. At right is AJA Vice President Kang Seok-Jae. President Ivan Lim of Asia Journalists’ Association (AJA) tendered a letter of petition for the release of Mr. Chuluunbaatar Dolgor, AJA’s vice president, to Mongolian President Tsakhiagiin Elbegdorj through the Mongolian Embassy in Seoul on June 2, 2011. Mr. Chuluunbaatar Dolgor, editor in chief of Mongolian daily newspaper Ulaanbaatar Times, has been detained by the Mongolian government for two months. At 11 a.m. on the day AJA President Lim and eight other leaders of the association visited Mongolian Ambassador to Seoul Gerel Dorjpalam at its embassy in Seoul to deliver the letter of petition urging for the immediate release of the Monglian journalist. At the meeting the AJA's founding President Lee Sang-Ki told the Mongolian envoy to deliver the petition letter to Mongolian President Elbegdorj and other high-ranking officials including its prime minister. The Mongolian envoy promised to AJA people that he would deliver the petition to the Mongolian president. The detained Mongolian journalist Mr. Chuluunbaatar Dolgor had been working as a newspaper journalist in Mongolia for the last 25 years, AJA press release said. The release said that On April 24, 2011 Mr. Chuluunbaatar Dolgor was detained by the Mongolian government on suspicion of the illegal private acquisition of the public asset and the serious damage to the asset. Mr. Chuluunbaatar’s lawyer asked the Mongolian government for his release several times but all of his requests were denied. Meanwhile, global journalist bodies and associations including “Reporters Without Borders” and “Globe International” started showing deep interests in Mr. Chuluunbaatar Dolgor’s immediate release, issuing statements. The following is the full text of AJA’s petition letter to be delivered to the Mongolian president. 1. We are writing to you to express our outrage at the continued detention of Mr. Chuluunbaatar, editor-in-chief of Ulaanbaatar Times, Vice-President of Asia Journalist Association, on 24 March on the charge of “illegal privatization and serious damage of public property”. 2. Mr. Chuluunbaatar has pleaded innocence to the charge lodged against him on 7 April but has yet to be given an open and fair court hearing in accordance with the law of the land and international law. 3. We wish to seek the immediate release of Mr. Chuluunbaatar on bail so that he can fight his case in open court as is his right under the Constitution of Mongolia. 4. AJA deplores the psychological pressure reportedly made by investigators to compel him to name names, which is against the Law on Criminal Procedure and Law on Arrest and Detention of Suspects and Defendants. 5. We urged the authorities to cease such illegal acts and to accord Mr. Chuluunbaatar his legal and citizenship rights under Mongolian law and Charter of human rights. 6. AJA supports the Confederation of Mongolian Journalists’s contention that the charges against Mr. Chuluunbaatar, a renowned author and journalist, is politically motivated. 7. Accordingly, AJA wish to lodge a strong protest against this victimization of our Vice-President, Mr. Chuluunbaatar and against the intimidation of the media through his incarceration. 8. We are further alarmed to know that our Vice-President is kept in detention even though he is in poor health and needs urgent medical treatment outside. It is unconscionable for the government to confine in a cell and cause him to suffer in sickness. 9. On legal, human-rights and medical grounds, AJA calls on the Mongolia authorities to free our Vice-President, Mr. Chuluunbaatar, without let and hindrance. 10. AJA seeks your good office to make urgent and necessary representation to the government of Mongolia on behalf of Mr. Chuluunbaatar.